Corn and soybean prices have weakened considerably since late May. 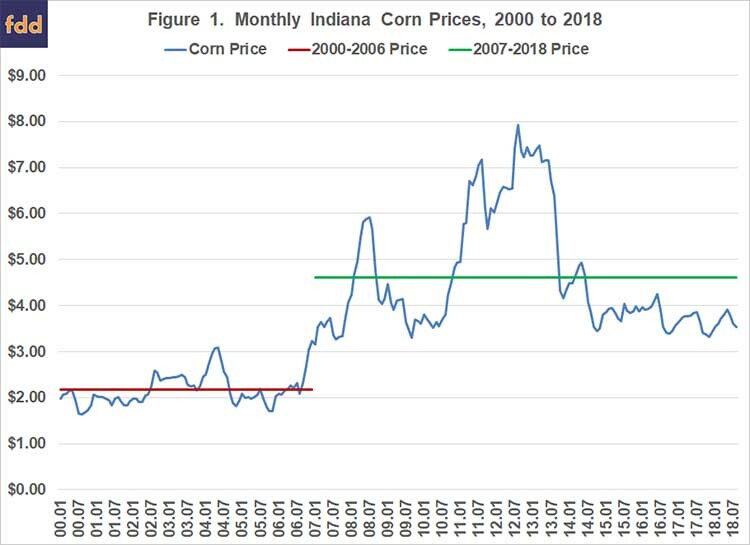 Using USDA-NASS corn and soybean prices for Indiana, corn prices declined from $3.92 to $3.54 per bushel from May to August while soybean prices declined from $10.50 to $8.85 per bushel during the same period. What do these price declines imply about swine finishing feed costs for the rest of 2018 and for 2019? This article examines trends in feed costs as well as the impact of corn and soybean meal prices on swine finishing feed costs. It is important to note that the swine finishing enterprise represented in this article assumes the finishing of an early-weaned pig. The ration for this enterprise consists of corn, soybean meal, dry distillers’ grain, and supplements. Corn prices represent averages for Indiana as reported by USDA-NASS. Soybean meal and distillers’ grain prices are obtained from Feed Outlook, published monthly by USDA-ERS. Information from Agricultural Prices, a monthly USDA-NASS publication, was used to compute supplement prices. Early October future prices for corn and soybean meal were used to project feed indices through 2019. Feed cost indices are reported on a closeout month rather than a placement month basis. 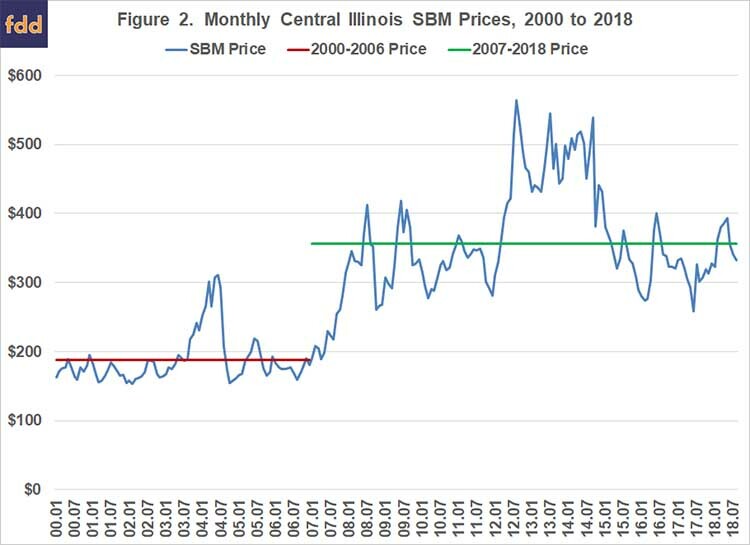 Figures 1 and 2 report monthly corn and soybean meal prices from January 2000 to August 2018. A distinction is made for prices before and after 2007. The period starting in 2007 is often thought to be a new price regime. Corn price averaged $2.18 per bushel from 2000 to 2006, and $4.60 per bushel from 2007 to the current month. Soybean meal price averaged $187 per ton from 2000 to 2006, and $357 per ton from 2007 to the current month. Corn price was above $4.60 from February 2008 to September 2008, from November 2010 to September 2013, and from March 2014 to June 2014. Since July 2014, corn price has been below $4.60 per bushel. Soybean meal price was above $357 per ton in June and July of 2008, from May 2009 to September 2009, in January and February of 2011, from March 2012 to March 2015, in July and August of 2015, from May to July in 2016, and from February to May 2018. Since June of this year, soybean prices have below $357 per ton. 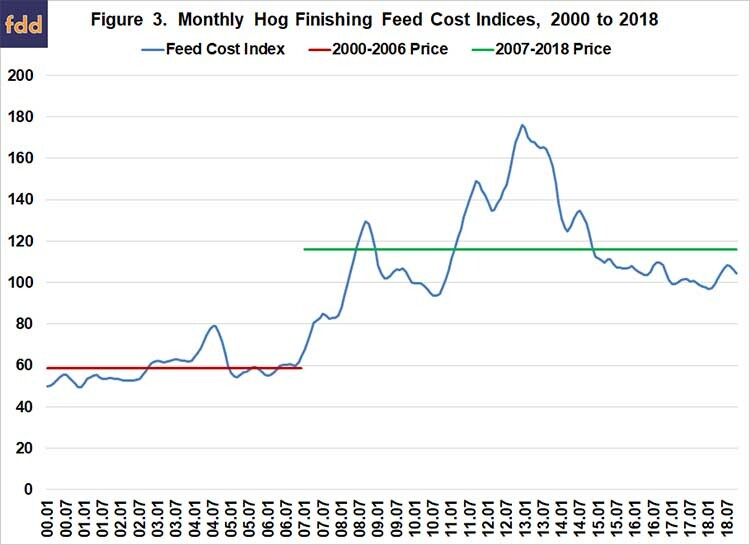 Figure 3 illustrates monthly swine finishing feed cost indices for the January 2000 to September 2018 period. The latest full year of indices, 2017, has an index of 100 so all indices outside of this year are expressed in relative terms. As with corn and soybean meal prices, a distinction is made between the before and after 2007 periods. The average index for the 2000 to 2006 period was 59 while the average index for the period beginning in 2007 was 116. The index for September 2018 was 106, so current feed costs are 6 percent above the average for 2017. Projected monthly indices are expected to be lower than the current index in the fourth quarter of 2018 and in 2019. Projected monthly indices for the fourth quarter of 2018 and for 2019 range from 100 to 104. 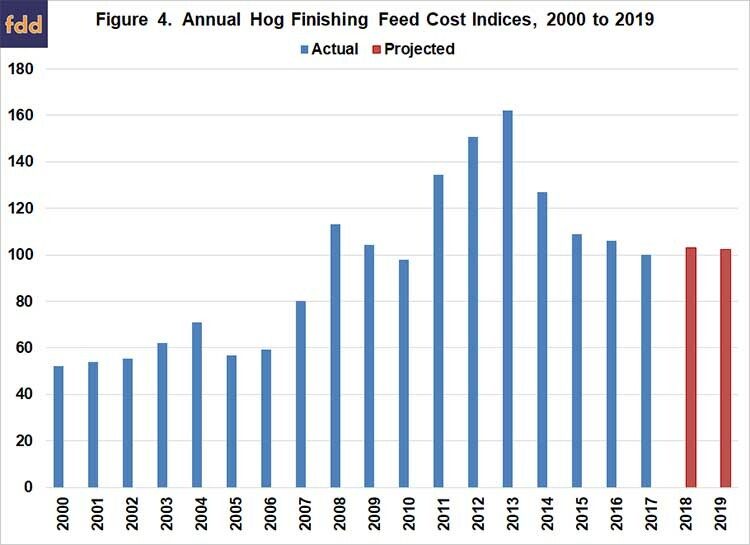 Annual swine finishing feed cost indices are presented in figure 4. The projections for 2018 and 2019 (red bars) used corn and soybean meal futures prices in early October. The projected feed cost indices for 2018 and 2019 are 103 and 102, respectively. Thus, swine finishing feed costs for the rest of 2018 and for 2019 are expected to be from 2 to 3 percent above those experienced in 2017. Feed costs are very sensitive to changes in corn and soybean meal prices. Regression analysis was used to examine the relationship between hog finishing costs, and corn and soybean meal prices. Results are as follows: each 0.10 increase in corn prices increases feed cost per cwt. by $0.46, and each $10 increase in soybean meal prices increases feed cost per cwt. by $0.34. Feed cost per cwt. in September was approximately $32.50. The recent $60 decrease in soybean meal prices decreased feed cost by approximately $2.05 per cwt. Using expected corn and soybean meal prices, feed cost per cwt. is expected to range from $30.75 to $31.75 in the fourth quarter of 2018 and from $30.50 to $32.00 in 2019. Table 1 presents feed cost per cwt. for corn prices ranging from $3.25 to $4.25 per bushel, and soybean meal prices ranging from $275 to $375 per ton. At the lower range of prices, feed cost per cwt. would be approximately $26.25. At the higher range of prices, feed cost per cwt. would be approximately $34.50. This article discussed recent trends in feed costs for a swine finishing enterprise, and provided projections for 2019. Feed cost is expected to be approximately 2 to 3 percent higher for the fourth quarter of 2018 and for 2019 than it was for 2017. Given the recent volatility of corn and soybean meal prices, it is important to gauge the impact of changes in these prices on feed cost. Each $0.10 per bushel change in corn price, changes feed cost by $0.46 per cwt. Similarly, each $10 per ton change in soybean meal price, changes feed cost by $0.34 per cwt.